Vikings head coach Mike Zimmer had emergency eye surgery last night, which means that special-teams coordinator Mike Priefer will step in as interim coach for tonight’s nationally televised game against the Cowboys. Mike Priefer ... where have we heard that name before? 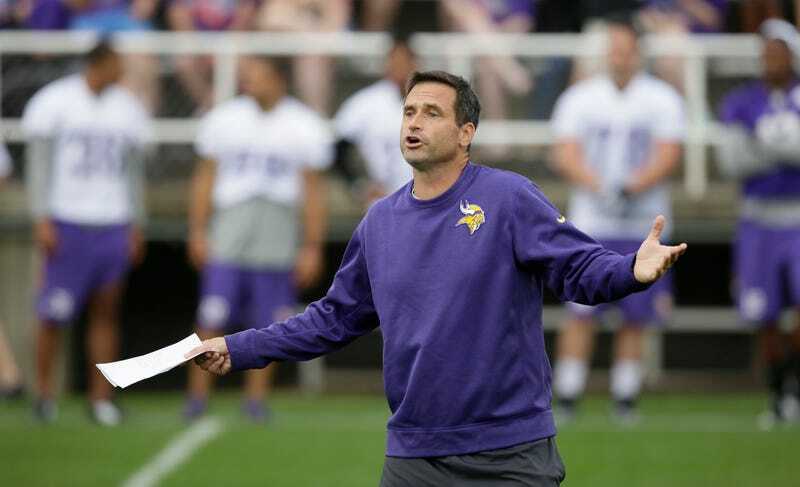 After former punter Chris Kluwe published his article accusing Priefer of calling for atomic bombardment of Gay Island, the Vikings commissioned an outside investigation into the team’s conduct. In his meeting with investigators, Priefer denied that he ever made the comment. Then the long snapper said he was there and he heard it too, and the kicker referred to the comment in texts, and Priefer was forced to come clean. Priefer was suspended for two weeks and required to undergo sensitivity training, and issued a public apology to Kluwe, the LGBT community, and the Vikings and their fans. His career certainly didn’t suffer for it—he’s well-liked by players and he reportedly got at least some attention for a couple open head coaching gigs. He’s good at his job, and that mattered more to the Vikings than any other consideration. Priefer will take the reins tonight rather than OC Pat Shurmur or offensive line coach Tony Sparano, both former head coaches, because the Vikings didn’t want to interfere with their play-calling duties.